We understand some people don’t particularly like Christmas trees, and some people simply don’t have enough room in the home for them. But, we wanted to include all you people with an aversion to the Christmas tree or those of you who don’t have enough space for one, so you can still get festive without the hassle of a tree in your house. Hang it in your chosen room and bring out your inner artist to draw up the most magnificent (and, most likely, the only) chalk tree your friends and family have ever seen! Feeling even more creative? 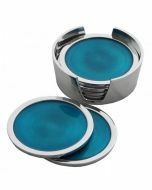 Stick on some tinsel, lights or even pull out the baubles. Minimalist? Hate the extravagance that comes with Christmas trees? 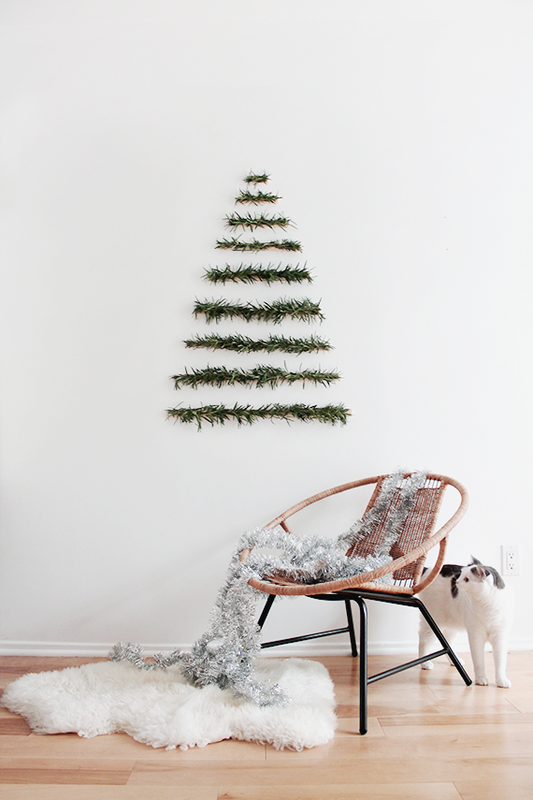 This super chic, super minimalist tree idea is probably a thing of DREAMS for you. Find some green tinsel, or your preferred colour, and cut into various sizes to create a triangle ‘tree’ shape. You could either use a hot glue gun to attach the tinsel to a wooden dowel that has been cut down to size, then use painters tape to attach to the wall – pushing as hard as you can to secure. 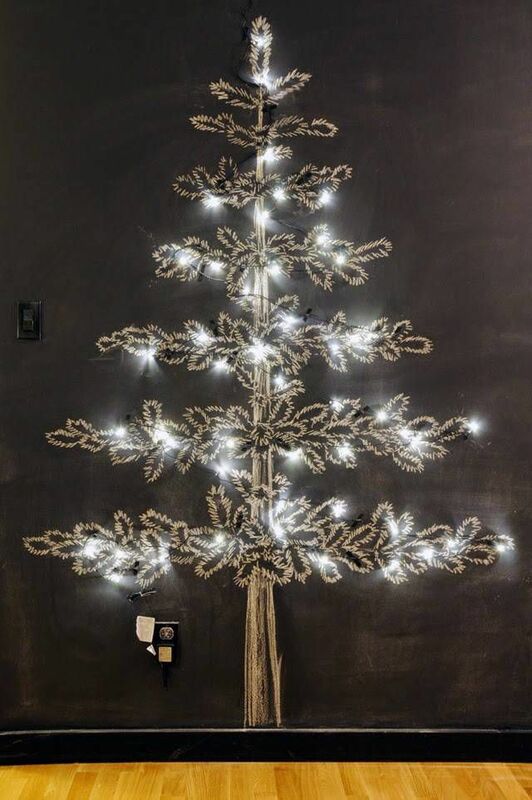 Or, you could simply just use sticky tape to attach the tinsel directly to the wall. 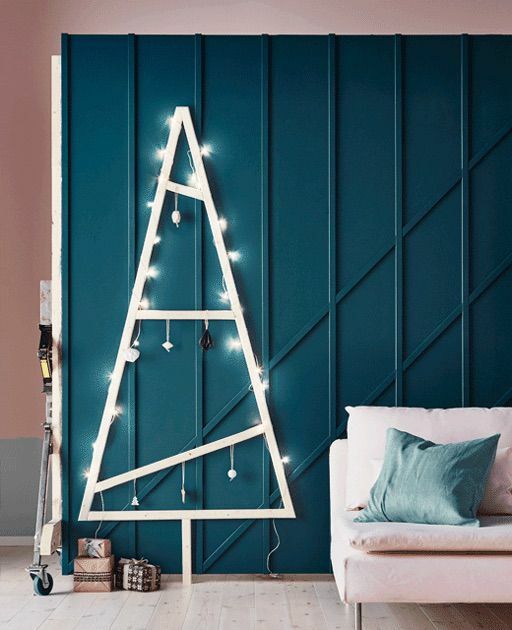 This is another modern take on a tree, bringing light and festivity to your home without the mess and space-consumption of a traditional tree. Find a piece of plywood that suits the style of your home, work out where the top of your tree will sit and drill a screw in there. Figure out where you want the bottom to be and drill a screw in each corner – tie string around the 3 screws, creating a triangle shape, this will act as a guide for the rest of your screws. Drill the screws down the sides on the triangle, roughly 4 inches apart. Start on one side and move to the other side when done, placing those screws on roughly halfway between the ones on the other side to achieve the zig-zag effect. Take your fairy lights and, starting from the top, wind the cord around the outside of each screw till you reach the bottom. And there you have it! A stunning, contemporary take on the Christmas tree. We’re taking some inspo from IKEA with this one! 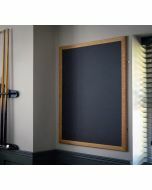 The frame brings that cosy festive feeling we all long for, without the mess of the pine needles that we definitely do not long for. 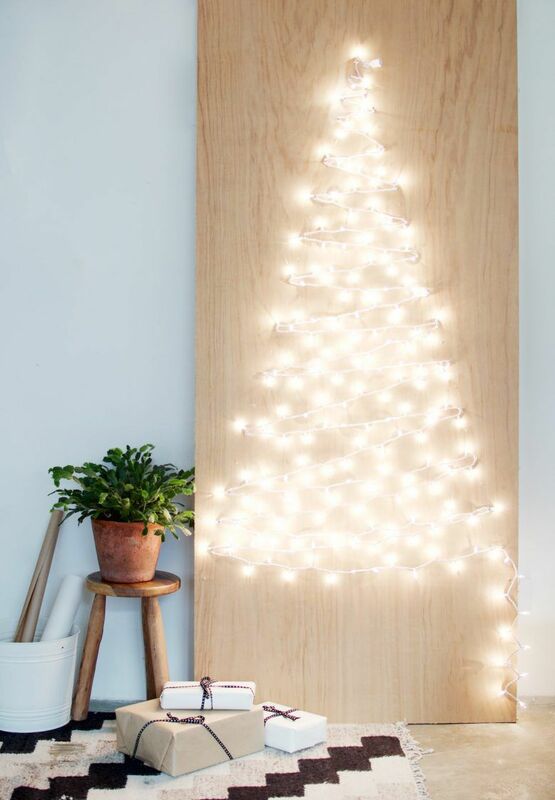 Plus, the “tree” is so simple and fun to DIY, and looks chic when done! 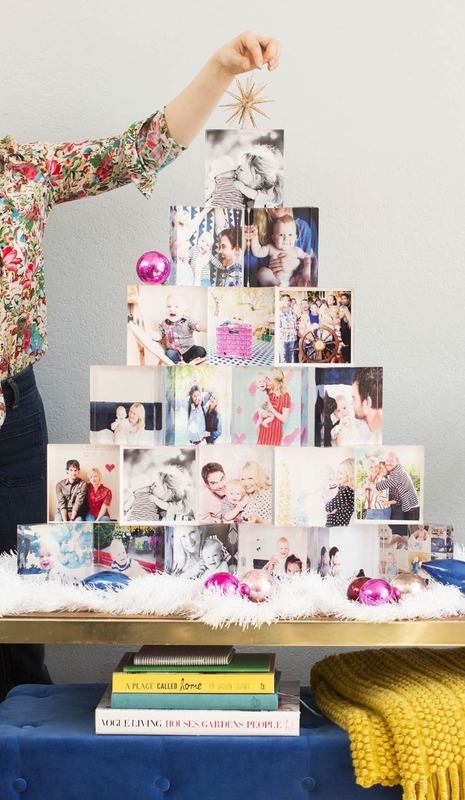 Put your favourite photos on display in a festive way with a photo tree! Who needs a tower of pine and flashing lights when you can showcase your favourite memories with your loved ones instead? Use ones from throughout the current year like a mini time hop. You can even decorate it with ornaments, tinsel and a tree topper if you wanted – but beautiful pictures look great on their own as well.